I designed this part of my website to chronicle my journey into astrophotography / astroimaging. This main page, in fact, details the highlights of that journey (most recent images at the top), showing what can be accomplished with some very modest equipment and a Zenic passion for the Universe. The icons below are links to my best images organized by category. Almost all of the DSO images here were processed using free software called DeepSkyStacker (DSS), stacking only multiple 20 second exposures - no sophisticated guiding, no cooled camera, no equatorial mount or wedge - just an LX200R 10 inch SCT telescope on an alt-az mount, and a Canon Rebel DSLR. My goal is the same as everyone elses - to document this fantastically beautiful Universe from within. I hope you enjoy these images as much as I enjoyed taking them! Not to sound too pretentious about this, but serendipity is something that interests me from a philosophical standpoint ...the way some things happen to people that is randomly relevant to their lives. Of course, coincidences do happen, but sometimes they're just a little *too* specific... Here's a picture of the Mars-Neptune conjunction, which occurred the night of Dec. 7, 2018 when I happened to be out with my telescope in Madison. One closer than this won't happen again until the year 2210. I just incidentally decided to take a picture of both Mars and Neptune (separately) while I was out looking for the comet, and "discovered" they were really close to each other (I can't believe I almost missed this!). The exposure on the left is 1 second using my Rebel T3i with focal reducer. You can clearly see the bluish-green disk of Neptune and a hint at the gibbous disk of Mars, only 87% illuminated due to its oblique position in orbit relative to Earth. The exposure on the right is about 20sec. If you look really carefully, you can see Neptune's moon Triton to the right really close beside it, 250,000 times fainter than Mars! That was unexpected for me....I really didn't think Triton could show up like that! More detailed imaging information is given here . This supernova was discovered Nov. 24, 2018 in the galaxy M77, constellation Cetus. I show it here in a blinking GIF (left), produced by superimposing an image of M77 I took about 4 years ago, with one I took on Dec. 4, 2018 combining images taken between 4 and 5 UTC. The second image (right) is another image of the galaxy taken 3 days later, Dec. 7, 2018, again showing the supernova, but in a slightly clearer image. I used the Dec. 4th image because it better matched the quality of the one I took 4 years ago. M77 is a barred spiral galaxy in Cetus, and also the brightest known Seyfert Galaxy. It is about 47 million light years away with an active nucleus but a significant amount of interstellar dust, possibly obscuring the supernova burst. More detailed imaging information is given here . Interesting side by side comparison of Mars oppositions in May 2016 (top) and August 2018 (bottom). Video images are shown on the left, and the corresponding stacked and post-processed images are shown on the right. Each video is about 2 minutes long, taken using a Celestron Skyris 132c camera through a Powermate 2.5X on a 10" LX200R Meade scope. Individual frames were extracted and stacked using a freeware program called Registax and then post-processed in GIMP. Note the clear difference in the atmospheric conditions associated with the acquired videos. You can see significantly more jitter and distortion in the top video as compared to the lower one. This is also reflected in the amount and clarity of the detail visible in the final post-processed images. The size difference between the two is also quite noticeable. The Mars opposition in 2018 (bottom) was a perihelic opposition, which means that the 2018 opposition occurred with Mars not only closest to the Earth, but also closest to the Sun, resulting in one of the closest oppositions since 2003! At the time of the image acquisitions (May 12, 2016 and August 7, 2018) apparent Mars diameters were 18.2" and 24.1" respectively, a difference clearly visible in the two sets of images. More detailed imaging information for the two stacked images (and their videos) are available here: Mars at opposition in 2016 and Mars at opposition in 2018. Two unrelated images, except for the fact that they are both planets closest to Earth:) This was my first image of Venus taken Sept. 3, 2018, at only about 15 degrees altitude, and my very last video with my Skyris 132c camera. My Skyris camera flaked out on me soon after, making me go out and buy the ZWO ASI385 color camera. I decided on the ASI385 camera because it had the same pixel size as the Skyris, but a wider field and faster frame rate. The image of Mars on the right is one of my first planetary images using the new camera, taken the night of Oct. 14, 2018. I was able to get over 21000 frames out of a 2 minute video at over 200 frames a second! I used a dark blue planetary filter, which seems to bring out nice detail (as it did with my previous attempt using my Skyris camera here ). Not sure why, but the balance of colors in the Skyris image was less affected by the deep blue filter than it was in the ASI385 - could it have been the brightness of the planet at opposition...? or a difference in the spectral response of the camera? In any case, the south polar cap shows up nicely here. Mars is only 87% illuminated, due to its angle with respect to Earth and so shows quite a dramatic phase. With Mars at opposition, it is so bright and large, it's a perfect opportunity to test out some planetary filters. Looks like the global dust storm on Mars that started in June has now subsided, thankfully. 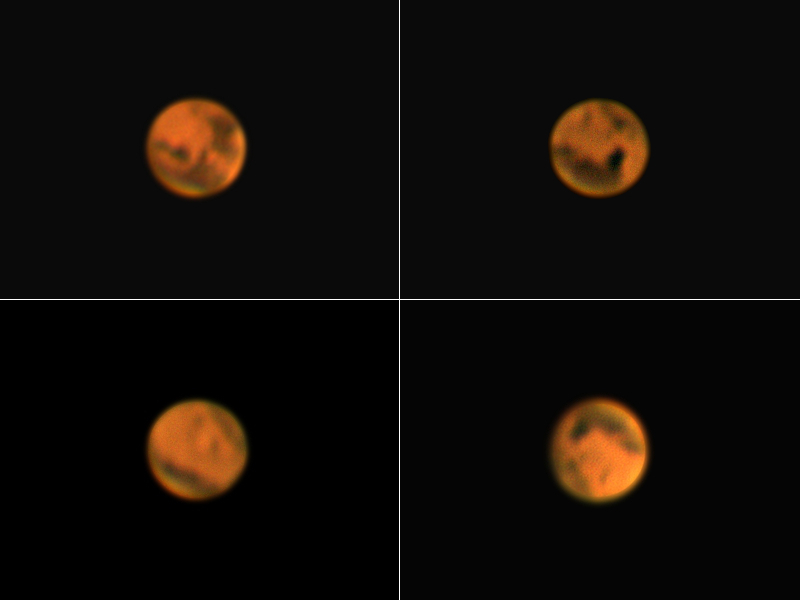 Here are four differently filtered versions of Mars taken the night of August 6, 2018. Clockwise from the top left are the following: un-filtered, yellow filter, orange filter and deep-blue filter. Normally my orange filter brings out the best contrast in Mars features for me, but with Mars so bright I was able to use my dark blue filter (which I rarely use) and still get	a decent frame rate. I was pleasantly surprised with the wonderful detail this filter was able to extract. Usually blue filters are supposed to only enhance polar ice caps and limb haze, and generally obscure surface features. I've read that ocassionally surface features are darkened and made visible as well (as in this image! ), although the phenomenon is not well understood. Links to more details regarding imaging details are here: unfiltered, yellow filtered, orange filtered, and dark blue filtered. Three planets in one night! The conditions weren't great, but I managed to get these three images the night of July 12-13, 2018 in Guilford, CT. I've been able to image each of these better in the past, but I couldn't pass up three in a row like this. I was a little disappointed with Mars, considering it was so close to opposition (wow was it bright!) but then I heard Mars was being enveloped in a global sandstorm that started June 20th and might continue into September! Sigh...I was looking forward to getting some nice images of Mars this time around. But looks like my Opportunity has been shut down (pun intended:). In any case, I used an orange planetary filter for Mars, which brought out some detail - I was surprised to see even that, but happy I was able to get something. I could not see any polar caps however. Conditions were poor so I couldn't even image Cassini's division all the way around - but it still looked beautiful as ever. I have more details about the actual imaging here for Mars, Jupiter, and Saturn. I took this on a very cold night this month, Jan. 13, 2018, with my Canon T3i and a focal reducer, using my standard ISO1600, averaging about 80 20sec exposures for a total time of about 25 minutes. Very nice nebula, and the first time I've imaged it in Concord, primarily due the trees in my backyard blocking my view of the southern sky. However, much to my wife's disappointment, they have now been cut down (yay!) allowing me easier and more regular access to Orion! So, here is a diffuse reflection nebula - NGC1977, also known as the Running Man Nebula, found along the sword of Orion just north of M42, and located some 1,460 light-years away. Herbig-Haro 45, an area of protostar formation is visible bottom center, and the main center area is divided by darker lanes of red glowing ionized hydrogen gas which resembles a man or ghost. Most of the scattered blue light is caused by several bright young stars - one of them the bright star 42 Ori - and each only 2 to 4 million years old. Here's a gorgeous image of the total Solar Eclipse on Aug. 21st, 2017, taken from a mountain top in Chilhowee, Tennessee. I took this through BAADER AstroSolar? Safety Film 5.0 using 1/800 sec exposure and ISO200 on a Canon T3i with a 70-300mm USM telephoto lens set at 200mm. Go to the rest of my eclipse pictures here. This was my first total Solar Eclipse. I had originally planned *not* to take any pictures, as I had heard many say that taking pictures detracts from your very first experience. 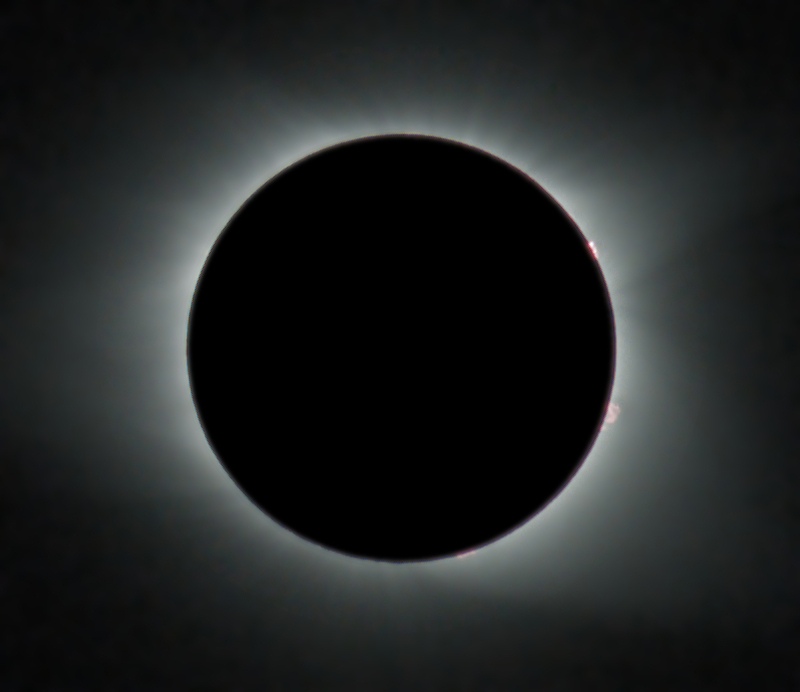 However, I did some research and found an application called "Eclipse Orchestrator", a great program by Moonglow Technologies that automates the image acquisition process during the eclipse, freeing you to watch the eclipse as it was meant to be watched. I must say the anticipation of the event, without doubt, heightened the experience. The appearance of two sets of sunspots made viewing the partial stage that much more exciting. The temperature, which had been 101 degrees Farhenheit before the eclipse began, steadily began to decrease as totality approached. The most obvious impending sign of the climactic event was the gradual descent of an ethereal, subdued lighting over our surroundings. When the time finally came, the transition was extraordinarily fast (as you'd expect with the shadow moving at almost 1500 mph!). Suddenly, within mere moments, the shadow of the umbra flowed across the trees and mountains in front of us, darkening the world below us. In the distance, clouds were suddenly illuminated as if by the setting of the sun. Bailey's beads shimmered and totality began. The temperature had dropped to a mere 81 degrees Fahrenheit. I looked up, and saw a black hole in the sky: Mars a hand distance to the right, Mercury a hand distance to the left, Venus about three times that distance to the right, and Jupiter about twice that to the left. It was dark around the hybrid body with stars around, with the rest of the sky in varying shades of blue. I had originally planned to look at the eclipse with my binoculars, but I never got the chance. 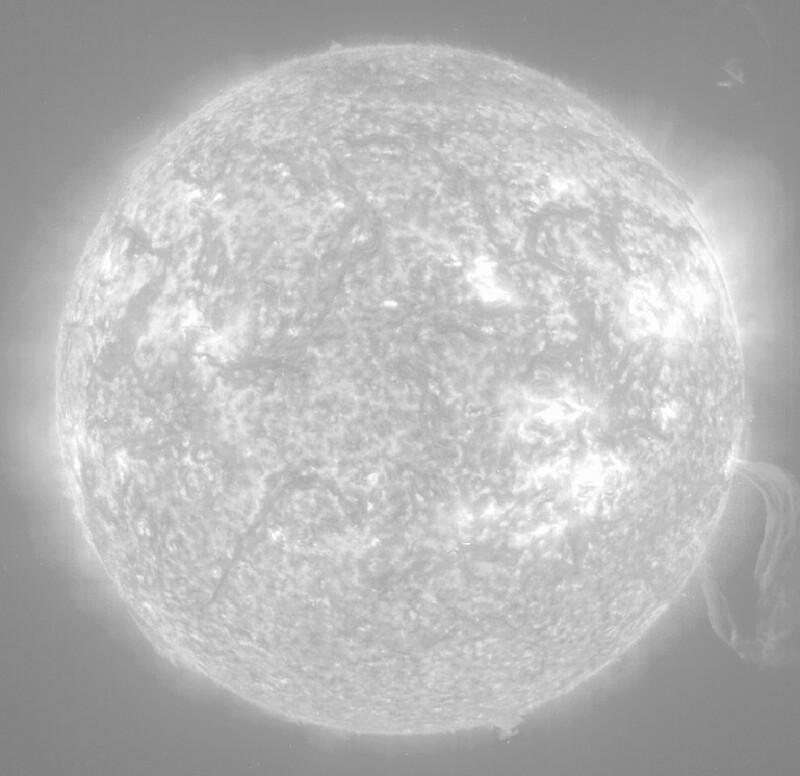 I stood mesmerized by the event with little time to take in what was constantly changing before me: fine coronal tendrils streaming from the surface of the Sun in flux as I watched without looking away. And before I knew it, totality came to an end. I must say I felt underwhelmed, after hearing so much about this life changing experience. Has it changed me? I can say this. As time goes on, the memory of that singular event continues to linger. My mind's eye continues to return to that brief moment in time to when a black hole formed in the sky and the sun was devoured by its negative image. The coronal tendrils continue to stream forth from the star that is my sun, and I can't seem to take my eyes off it. This is an image of IC4593, also known as the White Eyed Pea Nebula in the constellation of Hercules. I took this on a partly cloudy, moonless night the evening of July 16th, 2017 in Rhinecliff, NY. I'm continuing my series of very small planetaries - this one is only about 12" x 10", one of the smallest ones I've imaged with my LX200R 10". Despite its small size, I'm still using my focal reducer to insure I have enough stars for registration. My image came out quite well for such a small planetary clearly showing an elongation in the NW-SE direction, with a bright white 11.3 mag central star and a light green nebulous halo. This is a relatively old planetary nebula about 0.7 light years in diameter and located about 6800 light years from Earth. The corresponding image in the inset is a Hubble image showing the extent to which my imaging was capable of extracting the shape of the nebula. Ok, but room for improvement! You can look here to see imaging details . J900 (also known as PK194 +2.1) in Gemini is another really small planetary which came out reasonably well. I took this on January 30, 2017 in Concord, MA with my 10 inch LX200R and Canon T3i using an f/6.3 focal reducer. I obtained this image by stacking 74 20sec exposures at ISO1600 for a total of about 25 minutes. You can see some tracking issues as evident by the color misalignment of the star in the zoomed image. Nevertheless, there is still some good edge definition in this small high-excitation nebula. Located about 20000 light years away, this nebula was first noticed by Robert Jonckheere of the Royal Observatory in 1912. It has been observed to have two lobes, both just barely visible in my image. Below the main image are three versions of the nebula. The first is an interpolated zoomed-in crop of the nebula in the original image above. The second is a Hubble image in N2, OIII and wide band green light. Finally, the third inset is an infrared image taken from an Astronomical Journal article called "The unusual morphology of molecular hydrogen emission in the planetary nebula J900". The boundary of the infrared image is (coincidentally?) remarkably similar to the visible light image taken by me. Nice detail for such a small nebula, despite the tracking! FYI, as usual, I tried to manually select only the best images for processing. Nevertheless, this time nothing I tried seemed to beat stacking the top 80% (according to DSS). I had a fairly consistent star elongation for all my images due to my tracking which I think resulted in consistent smearing of detail. Because of that, I wasn't able to improve the sharpnesss of the image but managed to signficantly reduce the noise by using the largest number of reasonably good frames. Well, I waited about a year for this opportunity! I finally captured a picture of the International Space Station transiting across the surface of the Moon, on 6:07am on January 17, 2017! I normally use my web cam and telescope tracking to obtain images of ISS, but this time, all I had to do was focus on the Moon with my DSLR, then sit and wait. I managed to capture two images of the space station using 1/4000 sec exposure at ISO3200. My T3i only gets about 3.5 frames a second, so this was probably the best I could do. I must say, as far as experiences go, this probably sounds fairly mundane. However, I was quite surprised at the exhiliration I felt anticipating and then actually capturing these these images as the space station raced across the sky and across the Moon's disk...something about the realness and "beingness" of the event that makes you appreciate being alive...I know quite dramatic, but there are jewels everywhere if you know how to look for them. Anyway...if you're interested you need to check out CalcSky which can send out email notices about events like this to you, and of course, Heavens Above, a great site that can give you detailed times, coordinates and maps of all sorts of satellite events. NGC7026, also referred to colloquially as the "Cheeseburger" planetary nebula, is a small planetary found in the constellation Cygnus. It's an intricate 11th mag bipolar planetary nebula located about 6000 light years away. As usual, I took this image with a Canon T3i and Optec Lepus focal reducer through my 10" Meade, stacking 65 20sec exposures in DeepskyStacker for a total exposure of about 22 minutes. I was able to acquire a very nice, sharp image of the lobed structure of this nebula, in the late evening of Oct. 8, 2016, Concord MA. Click on this link to see a blended movie clip of the Hubble image version of this nebula superimposed on my image. My tracking wasn't perfect, but the details of my image match up nicely with the Hubble image! This tiny planetary known as Minkowski 1-64, is the second ring nebula in Lyra, but only 18" in diameter and quite faint at 13.3 mag. It is very close to being circular with only a slight elongation, and no detectable central star. This image I took Aug. 3, 2016, shows the very small relative size of the planetary in the field of view of my focal reducer - barely the size of a star! If you click on the image, you'll see an enhanced version of the nebula at the center of the image. That image actually consists of only the best 19 out of 99 frames I had, noticeably sharper (but somewhat noisier) than the image I obtained using 75% of the best quality images according to DSS shown here. This shows you the slight advantage you get from hand picking the best frames vs. relying on DSS completely, sharper stars and improved detail within the nebula itself, despite the small number of frames. I have found that of all deep sky objects, planetaries seem to benefit the most from using only the best frames. Back to Jupiter after a long hiatus! Amazing what stacking several thousand images can do... even poor quality ones at that! I stacked over 4700 images to get this image, using almost everything I had because I had so few really good frames. Nevertheless, with more frames, and the higher magnification of my 2X Powermate and Skyris camera, I was able to pull out some impressive detail despite what I thought were very mediocre atmospheric conditions the night of April 15, 2016. There were multiple moon transits that night...I managed to just miss the Io transit, but managed to catch the beginning of a Europa moon and shadow transit and a nice view of the red spot! If you click on the following short GIF, you can just barely see Europa against the backdrop of Jupiter off its left edge. The moon brightens suddenly in the last frame of the 5 frame sequence. Ok images, but still waiting for better conditions...! I obtained this image of the International Space Station back in June. This was the first time I was able to track the station for several hundred frames compared to my usual 2 or 3! Unfortunately, without a video tracking system, the LX200R tracker is just not good enough to maintain centered tracking of the station. The result is that you need to constantly adjust the tracking to keep the station centered on the chip. This doesn't allow for any time to adjust brightness or focus during the pass - so it's important to get it right from the start! This image was one single frame taken out of a 5 minute video obtained by my Skyris camera and 2X Powermate using my 10" LX200R SCT. I fought off armies of mosquitoes to get these...several globulars in the -30 degree declination vicinity, clockwise starting from the top left: M19, M62, NGC6356 (in Ophiuchus) and NGC6544 (in Sagittarius). You can click on the names to get more picture info. They were all taken end of June, middle of July time frame. I normally shoot about 100 20sec exposures at a time, but due to the low declination, I ended up shooting tree limbs for more than half of them! However, I did manage to pull out some nice color - in fact - too much color...I wondered why, despite my attention to focus and tracking, my images still did not come out as clear as I would have liked them to, not to mention the overwhelming reddish hue of the stars. Red giants? - I don't think so - at least not that many! Of course, the reason is the same as why the setting sun appears red and blurry on the horizon. Seems obvious, but you don't usually think of atmosphere as affecting deep sky objects in that way (at least I didn't), but obviously it does. Nevertheless, the contrast between the blue and red stars in M62 is real and quite beautiful, as is the oblate shape of M19, an illusion caused by its stars being symmetrically obscured by interstellar dust and gas! As you can see, all globulars are *not* the same - they each have their own unique character, and all stunning in their own way. I got lucky with this shot! Just as the clouds came rolling in, I managed to take this image of both Venus and Jupiter on June 30, 2015, a mere third of a degree apart using my 10" LX200R with 0.62X focal reducer. Jupiter had to be enhanced separately, but with a little work, the composite came out great! If you look closely, you can see several bands on the planet, including a small reddish smudge, which of course, is the red spot! - I verified it wasn't an artifact of the processing by looking up the transit time of the Red spot - right where it was supposed to be. Pretty amazing considering the magnification and the resolution of the image! This image also shows that it *is* possible to get a reasonable image of both Venus and Jupiter in the same frame using a single exposure time (in this case 1/400s and ISO400), provided you can enhance Jupiter sufficiently. Regarding the image processing: Jupiter was taken from another frame with the same exposure time but only about 30 seconds after the first Venus/Jupiter image was. The Jupiter region in the second image was enhanced, then cut out and pasted over top of the Jupiter in the first Venus/Jupiter image, then blended around the edges to improve its appearance. Absolutely, creative license, and maybe too much, but representative of the reality at the time, and the end result was a quite pleasing, capturing the moment as I saw it. To me, that's what much of this is all about - preserving memories and capturing the Universe's best moments! NGC2024 - The Flame Nebula in Orion: Finally got to this nebula! This emission nebula is part of the same molecular cloud as the Horsehead. It's located approximately 1200 light years away and situated just to the left of the lowest star in the belt of Orion. Apparently, out of the over 800 young stars in the center of this nebula, over 86% have circumstellar disks! This image was obtained by stacking 83 20sec ISO1600 exposures using a Canon Rebel T3i and my focal reducer at prime focus of my 10" LX200R on the night of March 9, 2015. Finally!...Comet C/2014 Q2 Lovejoy, taken on the (cold) nights of Jan. 10 and 13, 2015. The color of this comet is a beautiful and ethereal green - actually quite common - a result of carbon molecules fluorescing in ultraviolet sunlight. This is only my second comet...I wonder if most comets are this hard to image...Panstarrs seemed easier, but it was a daytime comet with a very bright tail. The tail on this comet, as yet, seems quite subdued, although it is clearly visible in two of the three images above. The top was taken using a 200mm Canon zoom lens at ISO800, showing the comet as it was placed in the sky on the night of Jan. 13th. The middle image is just a cropped version of the top one, but consisting of about 25 20second exposure images, stacked in DSS and aligned on the comet. The tail is clearly visible, and quite long, showing some distinct structure. The bottom image was taken the night of Jan. 10 at prime focus of my 10" using a focal reducer and a Canon T3i. Again, aligned on the comet stacking about 25 20 second exposures at ISO1600, the tail is just barely visible, but showing at least three "spokes" flaring off the top left side. Beautiful!